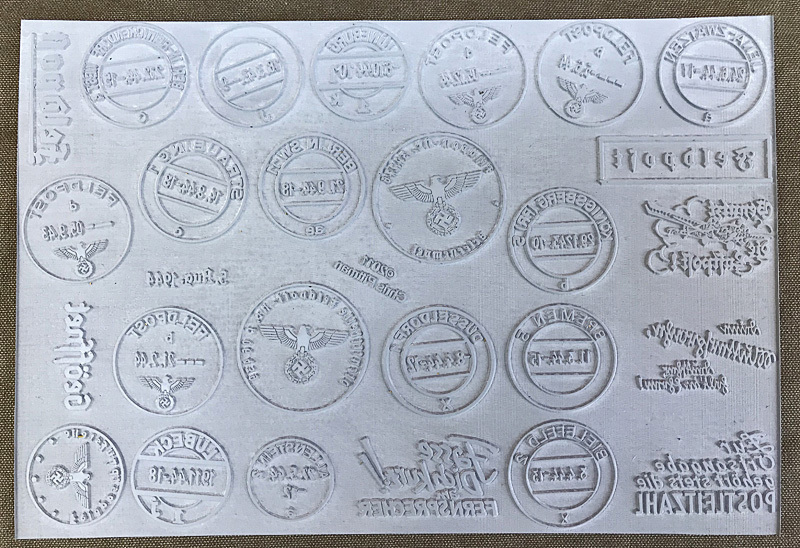 Many customers have asked us to offer sets of stamps for working on the Soldbuch, Wehrpass and other Nazi era military and civilian documents, for props and displays. The problem is that to make these documents look realistic requires a lot of different stamps and this can become very expensive. 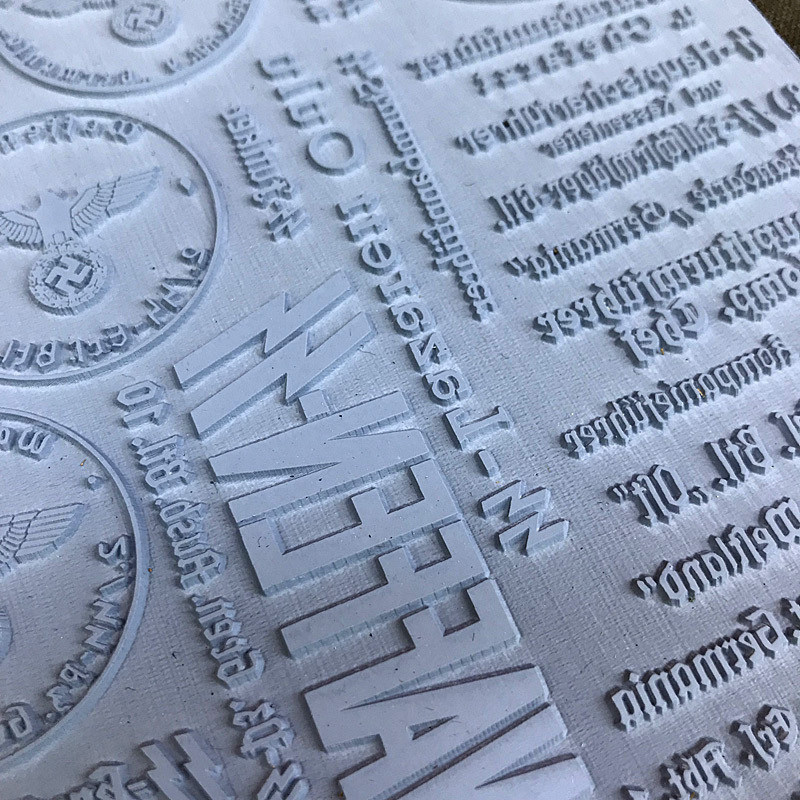 As a solution to this problem we offer sets of rubber stamps in the form of sheets of unmouted stamps, each one painstakingly copied from original documents in our collection. There are no fantasy stamps here, these are all direct reproductions of original stamps from 1935-1945. We take great pride in making exact, perfect copies of original stamps, each one painstakingly edited from high-resolution scans of original paperwork. 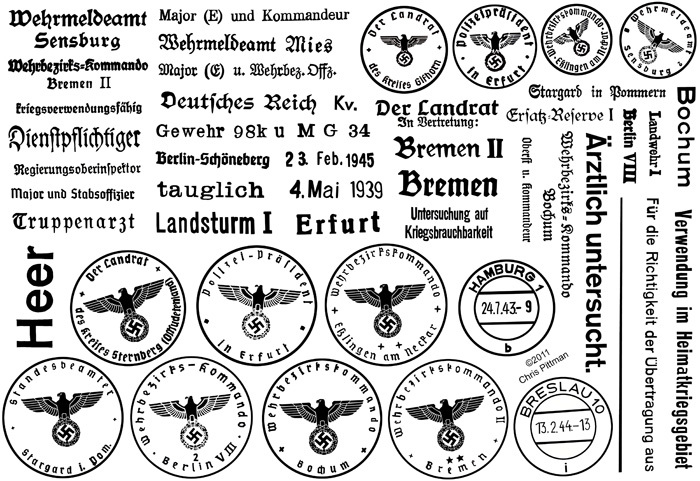 There are stamps here that can be used for every branch of the Wehrmacht, as well as for the Waffen-SS, and on paperwork for civilians as well. Each sheet measures 5.5 inches by 8 inches and is made from a quality red rubber material, laser etched with precise detail, made in the USA. 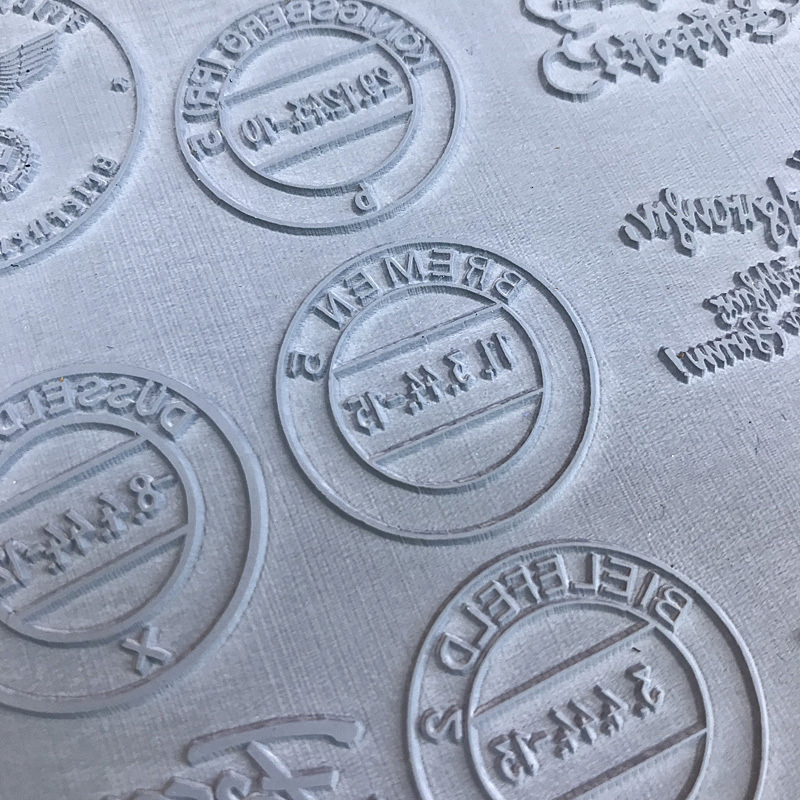 We will supply each sheet with a sheet of double-sided adhesive foam cushion material for you to mount these stamps to your handles. 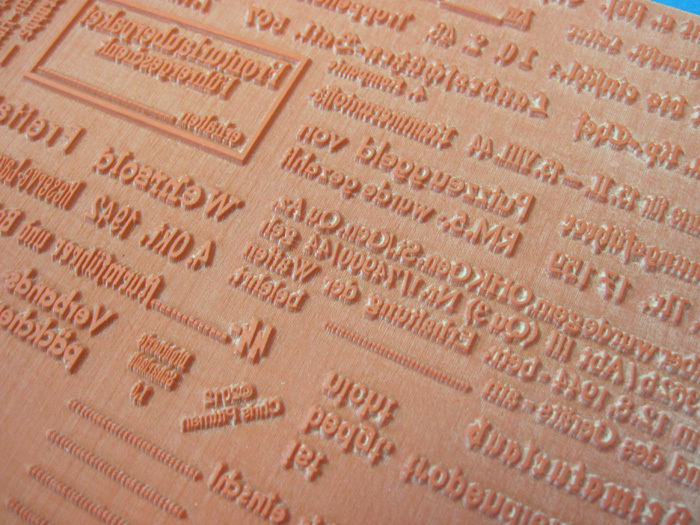 We will also supply a guide for cutting up the sheet as well as information about each stamp and how it was used. We don't have any handles to sell, you can buy old stamps and re-use the handles, make your own handles, or simply use wooden blocks. If you need stamps with handles we are happy to offer those individually. The price for each sheet is $49 plus shipping. These are made to order, the turnaround time is about 1 week. To order, please E-Mail Us at intrenches1945@gmail.com. Shipping rates: The cost to ship one sheet is $5 in the USA, $11 to Canada, $15 to Europe. The cost to ship multiple sheets is $6 in the USA, $18 to Canada, $25 to Europe. Orders will ship in padded envelopes. This set contains 49 stamps and focuses on stamps for the Soldbuch although there are stamps here that can be used on a wide variety of paperwork including award documents, various military IDs, the Wehrpass, Feldpost letters, etc. With these stamps you can create a very realistic-looking Soldbuch that looks like it has been carried for years and been stamped many times. 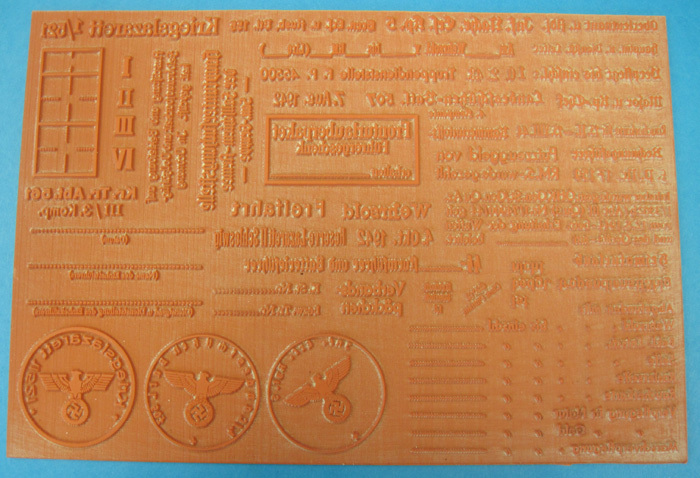 For more Soldbuch stamps, check out Stamp Sheet #4 below. -2 different blood type stamps for page 1: "Blutgruppe B' and "Bl. Gr. 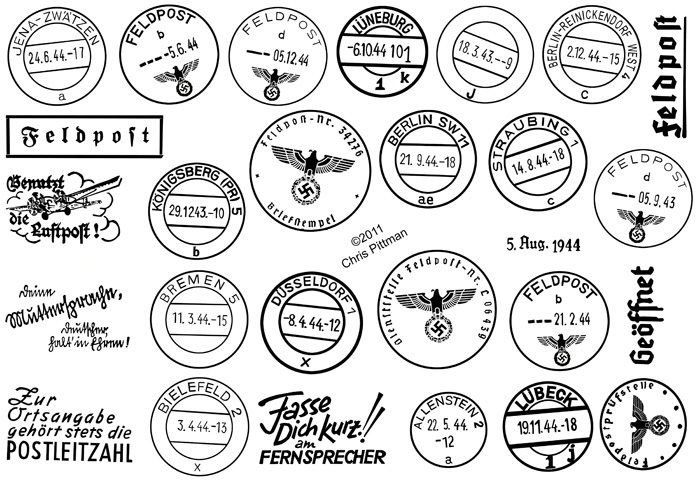 A"
Set #2 contains 47 stamps and focuses on the Wehrpass and Nazi-era civilian documents. The Wehrpass was the linchpin of the elaborate array of forms and documents that was used to keep track of every soldier as he moved through training and replacement units, field units, and hospitals. This important document would be issued by the recruiting authority and then kept by the individual as long as he remained a civilian. When he was called up for service, he would turn in the Wehrpass which would then be kept by his unit and would follow him everywhere he went as a permanent record of his military career. These Wehrpass stamps can also be used for other documents including call-up notices and forms related to recruiting, official correspondence, medical forms, and other documents. 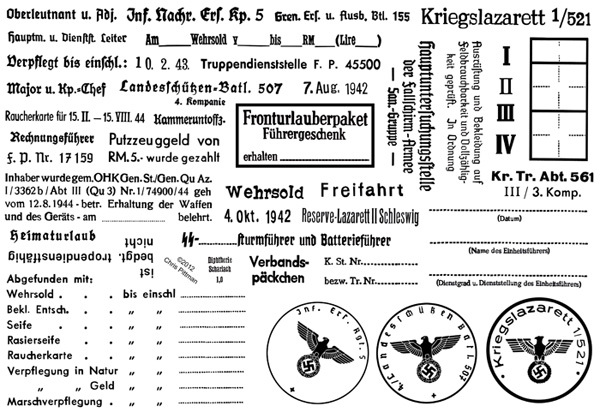 The civilian administration stamps on the sheet can be used to fill out a wide variety of paperwork used by civilians as well as soldiers including the Kennkarte, Reisepass, the Fuehrerschein, ration cards, birth/death/marriage certificates, reciepts, etc. 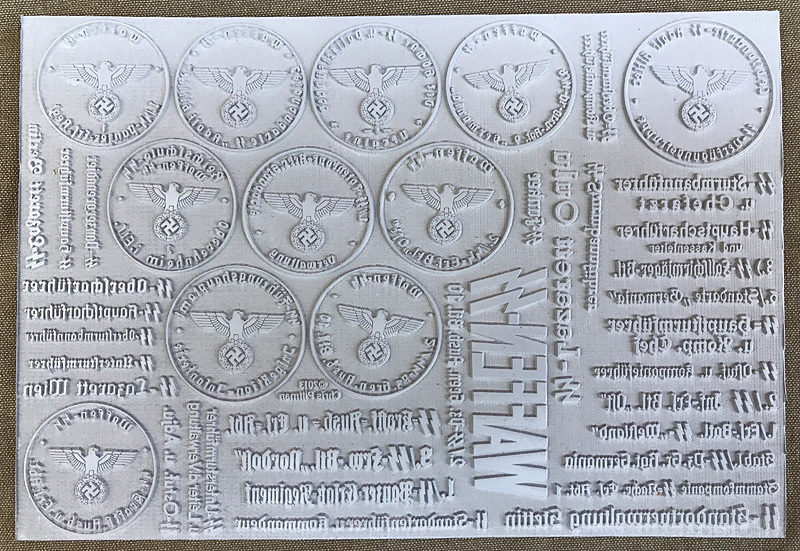 -Wehrbezirkskommando Bremen II: Large round eagle stamp, line stamp, line stamp "Bremen II," location stamp "Bremen"
-Wehrbezirkskommando Berlin VIII: Large round eagle stamp, line stamp "Berlin VIII," location stamp "Berlin-Schoeneberg"
-Wehrbezirkskommando Bochum: Large round eagle stamp, line stamp, location stamp "Bochum"
-Service classification stamps "Ersatz-Reserve I," "Landwehr I," "Landsturm I"
-Stamps for physicals: "Untersuchung auf Kriegsbrauchbarkeit," "Aerztlich untersucht"
-Major (E) und Wehrbez. Offz. -Polizeipraesident Erfurt: Large round eagle stamp, small round eagle stamp, location stamp "Erfurt"
-Standesbeamter Stargard: Large round eagle stamp, location stamp "Stargard in Pommern"
Set #3 contains 22 stamps to be used for Feldpost letters and German WWII mail in general. This set can be used for mail to and from the Front in 1943-44, and civilian mail as well. These stamps have all been exactly copied from original letters, only some dates have been changed to provide a complete range of dates within that time frame. These stamps include postal cancellations, military stamps and even a Feldpost censor stamp and are perfect for "mail call" or simply for creating reproduction letters as props to add detail to an impression. The stamps can be used for letters and also for official mail such as draft notices, death notices, etc. Set #4 contains 41 stamps for the Soldbuch. These are all different from the stamps in Stamp Sheet #1 above. These are all exact copies of stamps from original Soldbuecher, many of them can also be used on a wide variety of military documents including the Wehrpass and all kinds of IDs, award documents, leave passes, etc. There are at least 15 great stamps that can easily be added to virtually any Soldbuch regardless of branch, to create a more authentic look. There are also new medical stamps and stamps for a number of Heer replacement and training units where soldiers of all branches could have served initially (before transferring), many Heer soldiers spent time in these types of units throughout their careers when they were convalescing or were between field units. 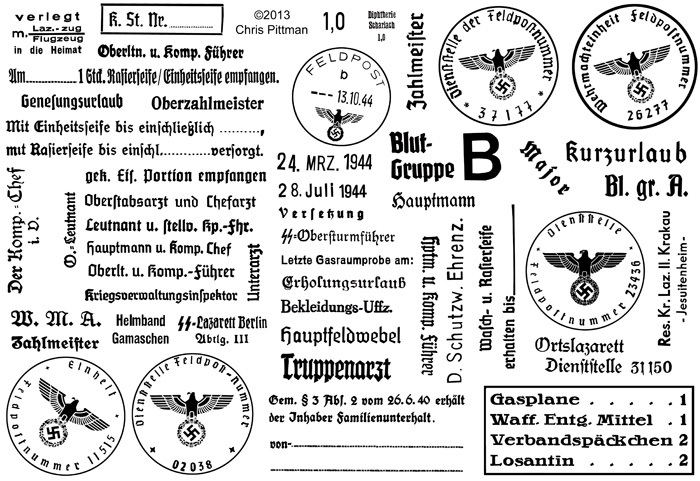 There are also a couple "generic" unit stamps where the unit identity is concealed with a Feldpost number, these could represent almost any kind of unit in any branch. 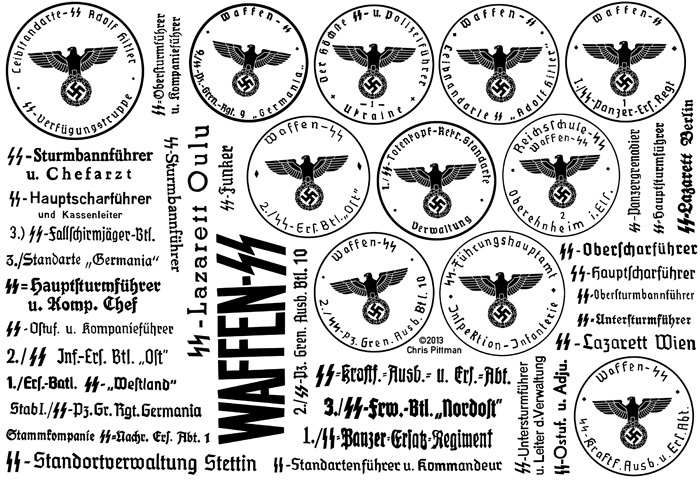 Set #5 contains 42 stamps for the Waffen-SS. None of these appear on any of the other sheets. These are all exact copies of stamps from original documents, I have focused on stamps for the Soldbuch but many of them can also be used on a wide variety of military documents including the Wehrpass and all kinds of IDs, award documents, leave passes, etc. I have tried to choose a representative assortment of different units and unit types with a focus on training and replacement units as these were the units that usually issued the Soldbuch, Fuehrerschein and other basic IDs. TO ORDER: E-mail us at intrenches1945@gmail.com. The price for each sheet including the instructions and mounting cushion is $49 plus shipping (shipping rates are at the top of this page). Please specify sheet #1, sheet #2, sheet #3 or sheet #4.